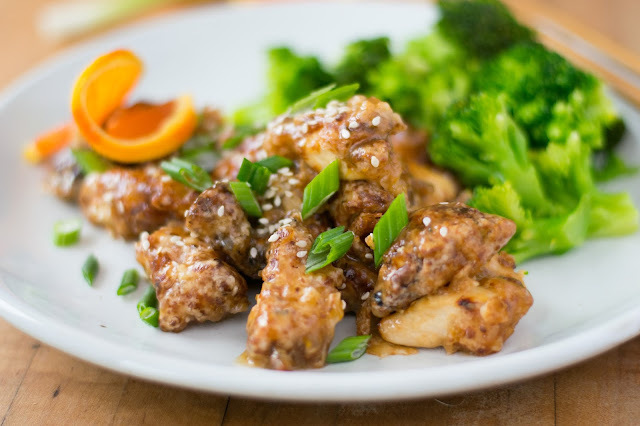 One of my favorite things to pick up at Trader Joe's is their frozen orange chicken. We don't do a lot of frozen meals at Kitchen Wife HQ, but just like many of you, life gets busy sometimes and the convenience of it is nice. However, the other day I was REALLY craving it, and didn't have any on hand. I decided to research how difficult it would be to make Homemade Orange Chicken and I was thrilled to find out it was actually pretty simple. To begin you will need to combine all of the ingredients for the sauce into a mixing bowl. Pour one cup of the mixture into a measuring cup and place to the side. Cute the chicken into bite-sized pieces. Place the pieces of chicken into the marinade in the mixing bowl. Cover and place into the refrigerator for 30 minutes. As for the sauce you set to the side, pour it into a small sauce pan. Place two tablespoons of the cornstarch into the sauce. Bring to a boil, whisking continuously, until the sauce thickens. If it gets to thick, just add a little water and whisk in. Take off of the heat and sit to the side. Now place the vegetable oil into a deep skillet over HIGH heat and allow it to get HOT! While the oil it getting hot, you will need to place the remaining cornstarch into a shallow dish and dredge the chicken into it. Tap of any excess cornstarch and place on a plate. Once the oil is hot, GENTLY place the chicken into the oil and cook for 2-3 minutes until fully cooked and golden brown. You will need to do this in batches as not to crowd the pan. I did three. Remove the chicken from the oil and place on a paper towel lined plate. Next, place the chicken into a bowl and pour the sauce over it. Gently toss the chicken in the sauce and you are ready to go! You can serve this over a bed of rice or with a georgous side of steamed broccoli like I did here. 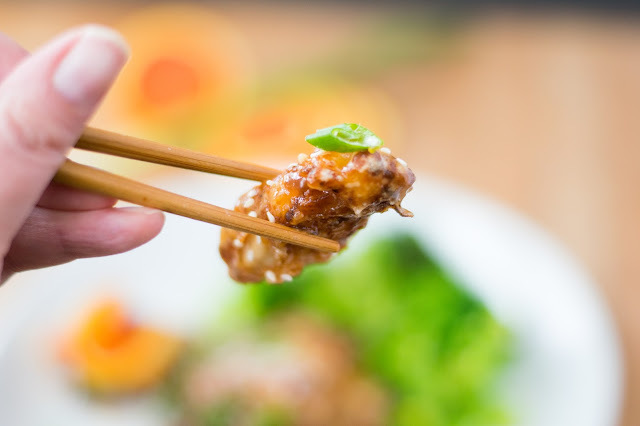 I also topped this Homemade Orange Chicken Recipe with some green onion and sesame seeds for a little texture and freshness. Now for the moment of truth...THE BITE! 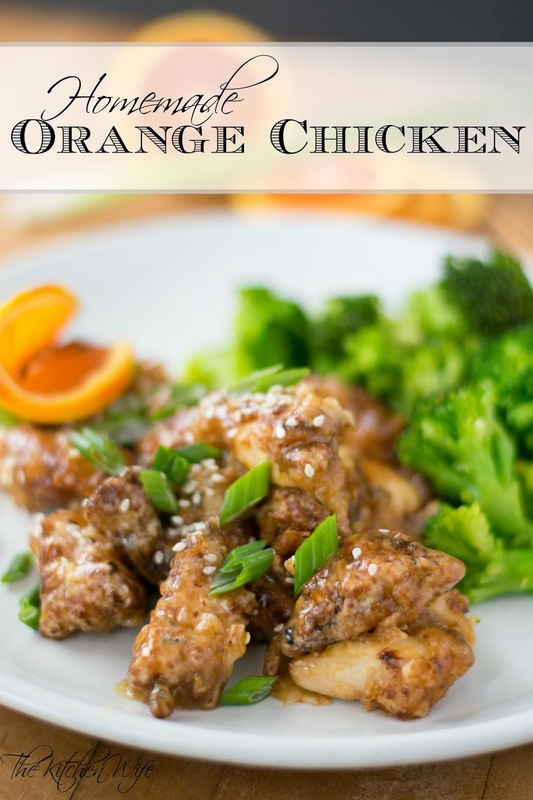 MMMMMMMMMMM.........This Homemade Orange Chicken Recipe is BETTER than Trader Joe's, BETTER than take-out, it is OUT-OF-THIS-WORLD! I know it seems like a lot of steps, but honestly in under an hour you can have this delicious chicken dinner on the table that EVERYONE is going to love! So, get in the kitchen and make it TONIGHT! Combine all of the ingredients for the sauce into a mixing bowl and whisk together. Pour 1 cup of the sauce mixture into a measuring cup and sit to the side. To the remaining sauce mixture in the bowl, add the chopped chicken, cover, and place in the refrigerator for 30 minutes. While the chicken in marinating, Pour the reserved sauce mixture into a sauce pan, add 2 Tbsp of the cornstarch, and whisk until smooth. Place the sauce pan over high heat and bring to a boil, whisking continually. Place the oil into a deep skillet over medium/high heat and allow to get HOT! While the oil is heating up, place the rest of the cornstarch into a shallow pan and dredge the chicken. Tap off the excess cornstarch and place the breaded chicken on a plate. Once the oil is hot, add the chicken in batches to the oil. Cook for 2-3 minutes, flipping half way through. Remove from the oil and place on a paper towel lined plate. Place the chicken into a bowl and pour the sauce over it. Gently toss the chicken in the sauce. Top with the green onions and sesame seeds. *If you sauce gets too thick, add a little water and whisk. Thank you for sharing. I've added your homemade orange chicken recipe in my favorites.